How to pick the best VPN service? While the question of internet security, and especially the security of your personal data, has been a hot topic for almost a decade now, the last few years have given us several good examples worldwide why we should take detailed measures to protect our person and our data from malicious entities that are lurking on the internet. Aside from the archetypal hacker, hiding in an undisclosed location, typing fanatically on the keyboard, coding a virus or trying to guess your password, there are much more sinister forces that are out there trying to collect and often misuse your data. Governments are now officially buying your browsing data from your Internet Service Providers, for reasons that are not always aimed to protect your security, and more often than not go above and beyond what most people would consider being legal. Even if you don’t live in a country where the government gives itself much more liberties than it should, there are always corporations that are desperate to get your browsing data as to gain an advantage over their competitors in selling something. This type of intrusion is not always malicious for your device and usually doesn’t affect your most private information, but is still intrusive and, above all, annoying. There are two prime reasons why anyone should use a Virtual Private Network (VPN), and with the current progression of laws, freedoms, and cyber-attacks almost everyone now needs a VPN. The primary reason is concealing your IP address and your browsing data from both your Internet Service Provider (ISP) and anyone else who would like to know what are you doing on the internet. The secondary reason is to be able to access data, communication, and media that has been restricted by your ISP for whatever reason. When choosing the best VPN service, it is important to know what we are looking for and what protections do we want from said service. To know this, you should be aware of the laws in your location and the tenacity of the companies that see you as the market. There is also the probability of identity theft, which is much larger if you live in a developed country. Once you know what exactly do you want the VPN to protect you from, it is a simple game of deduction to find out which is the best VPN service for you. Some aspects of a Virtual Private Network are more important than others, and some networks could ‘’look” very pretty, with all kinds of perks, but lack the few basic things. Also, when it comes down to the few of the very best, some small nuances could be the thing that makes your mind for one or the other. There are 10 categories that are important when choosing the best VPN, and they are ranked from the most important, to very specific and mostly technical. As when using most services, having a trusted and reliable service provider is of prime importance, and that is especially true when choosing a VPN provider. When you subscribe to a VPN service you are giving access to your identity and data, as well as browsing history, to a 3rd party, which is your VPN provider. You will need to keep yourself informed and research the company history before you start using the service. Aside from dummy companies which are just a front for malicious entities online, there are also newly founded companies which are just inept to provide you with a good service for a longer period of time. You should always use a VPN company that has a proven track record and that has positive reviews and happy customers. There are also a couple of red flags for unfamiliar VPN providers, that will alarm you to the company not being reliable, or at least having bad business practices, which would also scratch that provider from the list of best VPN services. Losing client data may be due to either malice or incompetence, and there are a few VPN providers which regularly lose their clients data and have breaches to their servers. This is a major red flag and you should always avoid such companies, regardless of the reason why they lose the data. It is a red flag if a company is offering deals that are bigger than what a VPN provider of that size could offer. This includes lifetime offers from companies that exist for a short while. Buying lifetime VPN services may seem as a good deal, but as we know that most companies fail in the first two years, you may end up paying for a lifetime service for a company that will close their doors tomorrow. While having marketing deals and sponsorships is normal, if you see companies that are paying large sums of money to be placed in the top rank, but don’t match that rank in customer review, this is a red flag. This doesn’t usually spell malice but is a very inefficient use of the company’s money and a bad business practice, where more money is given to the marketing department than to the maintenance of the servers. Good people are proud in their work, and reliable VPN providers are more than willing to tell you exactly who they are and where they are from, so you would know to trust them if they ever make another product. Having undisclosed ownership is an enormous red flag, as this is usually done for malicious purposes and you should never use any service where you don’t know who owns it, let alone a service where you plan on giving that unknown someone access to your private information. For whichever reason you are using a VPN, security is, and should be, your prime concern. Without being sure that your VPN provider can protect you, your device, and your data, there is no point in picking that provider. All VPN providers and even many proxy servers will offer you privacy when the system is operating as it should, but as there are numerous threats on the internet, it is very important that the VPN provider you choose has all the necessary protocols in place that are meant to protect your data. Because of this, it is always prudent to select a paid VPN provider as protecting the servers and updating the system is a costly and labor-intensive job, which needs a set of professionals to function properly. While some internet privacy enthusiasts could set up a free VPN, malicious software and outside attacks will be both constant and evolving, with a matter of time when your VPN connection will become unsafe and your data compromised. Almost counter-intuitively, those services that cost a lot are not always the best, as that usually means that the VPN provider doesn’t have a lot of users. Finding a reliable and safe VPN means looking into spending about a dozen dollars each month for a high-end service. One of the services like this is Le VPN, which offers prime service but has enough users to spread the base costs of security and maintenance and make the cost acceptable to the single user. Once you are certain that your connection is secure, you can further deduce the selection from the connectivity the VPN provider offers. A reliable connection to the VPN server is something that you will need as to have an uninterrupted browsing experience, and especially if you aim to download larger amount of media, such are video files. There are two important factors in this category, and that is signal strength and accessibility. Signal strength is what we usually mean when discussing connectivity problems with our ISP, but when dealing with a VPN, this shows the stability of the server and a weak signal might be a sign of a server that is under attack or was not put under proper maintenance. Accessibility is a relatively new factor, as it poses the question of the number and type of devices that can be connected to a VPN server. With the rise of smartphones and tablets, you will have to make sure that your VPN provider has implemented all the protocols needed for the safe browsing of these types of devices and also that there is a good application that will help you connect to a VPN easily, and stay connected. This aspect is probably something users are most familiar with, even when they are unsure why do different VPN providers have different internet speeds, depending on the location of the server and the maximum connection speed both your device and the server itself have. It needs to be mentioned that the final internet speed you will have will always be same as the slowest connection in the line between your device capability, the speed provided by your ISP, and the speed of the VPN server. 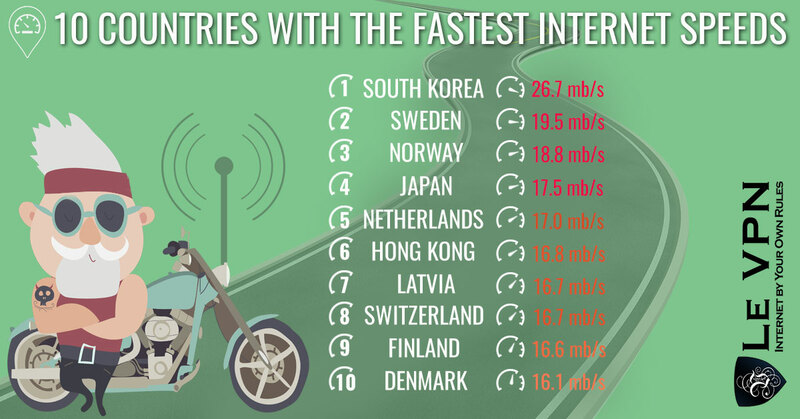 Even though the best VPN providers offer fairly large internet speeds, if your own connection to the internet is not as fast, you will experience that speed. When calculating how fast your internet will be when you are using a VPN connection, it is also important to know where the server that you are connecting to is. While latency issues don’t impact the speed of the connection itself, it will influence your experience and can make the internet seem slow. Because of this, when you are searching for the best VPN service, you need to focus on those VPN providers that have servers near to where you are, and preferably in multiple locations worldwide, which is a segue into the next category. There are multiple reasons why everyone searching for a VPN provider should focus on the number of servers and VPN provider offers. Having a good and stable server is a tricky thing and it is often that they need maintenance, or are being updated. This is why more is always better. As most VPN providers are little more than a small network of proxy servers, they will not have their number of servers and locations listed, as the rule of thumb is that where it is not advertised, the number is usually one. Provided that the VPN service provider has passed the former three categories, you will not be able to see the value of multiple servers right away, but will do so very quickly. If you rely only on one server, you will see that it will be down even several times in a day. In cases with reliable and reputable VPN providers, like the aforementioned Le VPN, they have a large amount of servers (800+) covering 114 countries, which mean that even if you get disconnected from one server for any reason, you will still be able to connect to another one nearby, loosing very little, if any, speed. Finally, as different counties have different legislation they are forcing the ISPs from that country to follow, you may never know which type of data will be restricted in the country where your VPN is connecting, and it is good to have options. This category is usually disregarded all up to the point when it is needed. The low expectations we have grown to have towards customer service is probably the reason why most companies, not only between VPN providers but in general, lack in this field. When it comes to VPN providers and customer support there are three distinct categories: The good, the bad and the downright non-existent. The non-existent category is fairly self-explanatory as this includes VPN providers that provide no customer support. This usually includes free VPNs and such doggy services, but may sometimes include paid VPN. This is a major red flag and you should avoid these companies, as when something goes wrong you will never be able to know if it’s something wrong with your device, your ISP connection, or if the servers of the VPN are down. This kind of unprofessional behavior is unacceptable for any service, and could never be even a good VPN, let alone the best on the market. In the middle, there are companies that offer a ticketing system, which is much better than nothing but can be really slow depending on the company. Once you have a problem, you submit a ticket and then wait for it to be resolved. If you are using your VPN only for simple browsing, and the problem is not preventing you to do exactly that, this waiting period may seem like a small issue, but it is not something to look for when searching for the best VPN provider. Finally, there are companies that offer a live chat option on their website, with people who will offer you instant answers to any of your technical needs. This type of service is something only the best VPN providers have, and it is a sign of reliability and dedication to the service, which is something that should be standard in all companies, and especially with internet security. Le VPN offers both a live chat support in various languages in the pick hours of different time zones (North America, Europe, Asia), as well as a 24/7 ticketing support system with an average reply time of 1 hour and a maximum of 12 hours. A fairly new problem has risen with VPN providers in the last couple of years, and especially with the popularization of smart devices, and that is that a single person will use multiple devices for the same thing depending on their location and the time of day. Sometimes, a single person will use multiple devices at the same time, which can place a strain on the VPN server. When trying to hide your IP and browse freely, it is important for all of your devices to have a VPN, as malicious entities will try to patch the information they have with what is hidden, and still gain access to your information through unprotected devices. Companies like Le VPN, which have recognized this problem, offer multiple applications for multiple platforms and, with every VPN license, give you access for multiple devices. Regardless of the platforms you use, all of your devices will be linked to the same license and will be protected and shielded when browsing, even if used at the same time. Although it is fairly easy to connect different devices to the same server, as that is the primary role of the server, only the best companies offer support for all the relevant, and even some less relevant, platforms. While your PC might be running Windows or MacOS, your phones are not on those systems, as even Windows Phone and iOS are quite different platforms. Aside from those, many people use Android phones, like Samsung, Huawei or LG. 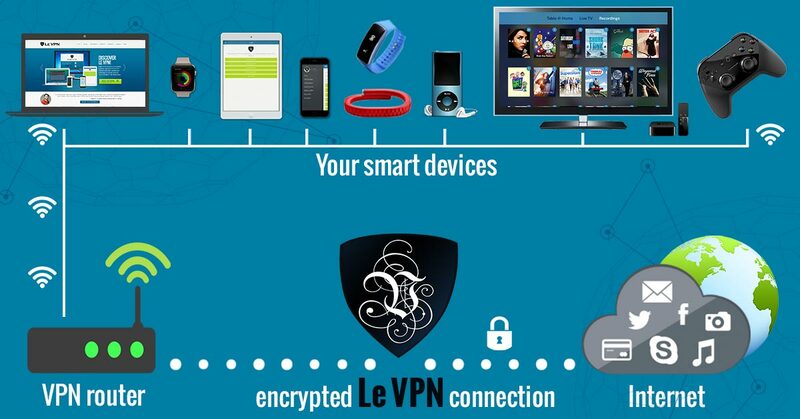 Companies like LeVPN offer applications and, more importantly, support for all these devices and also Linux and Chromebook, as well as the direct control installation for VPN routers like a DD-WRT Router, which can come in real handy when you have multiple smart devices, plus smart TVs, game consoles, Kodi VPN and more. If you are searching for the best VPN provider, you need to make sure that all of your devices are supported and that the applications offered are easy to use and provide a stable connection, as well as additional features. As mentioned, different countries have different laws regarding the internet, and one of the prime reasons why people are using a VPN connection is to bypass some countries restrictions of what the government thinks should not be seen, watched or consumed. While some places have very relaxed rules about the internet and usually only draw the line at engaging in serious crime, others have rigid restrictions, especially when regarding religion, politics and adult content. To bypass this, your VPN provider must be located in some of those countries with normal internet laws that don’t require ISPs to deny you specific service. In some countries, like the United States, even the ISPs restrict content as they restrict using services that belong to another ISP, or their corporation. The same reasons for geographic diversity exist here as they do in China because of the government. Best VPN providers will have multiple servers in multiple countries, with a special focus on those countries where internet privacy is protected and content is free to be shared. The more countries your VPN provider has servers in, the better, as this means you will be ready for any legislation in any country and will be able to change the server very quickly once it becomes unusable. Only the best few VPN providers are friendly towards torrents and P2P connections and while this may be the least of someone’s problems, for others this addition may be a game changer. Having an option to share files directly from other users and to still be protected by a VPN is a much harder task than it seems. Usually, when you connect directly to another user, for whichever reason, you will need to provide that user with your IP address even if you are using a VPN, and this was usually done automatically. Afterward, this service was blocked for security reasons with only the best VPN providers finding a solution. Finding the best VPN service might sometimes seem like finding a needle in the haystack, but the truth is that once you specify what you are looking for, only a few remain, all of them usually with premium service. In the end, you will be left with companies like Le VPN, which offer a safe, fast, reliable and professional service, with which you will be able to browse the internet safely and freely, using the internet as it was intended: For whatever you want.